In addition to adding the compact wide-angle prime lens to your camera bag, the Sony FE 28mm f/2 Lens with Circular Polarizer Filter Kit from B&H also includes a 49mm circular polarizer to help reduce reflections and increase saturation. 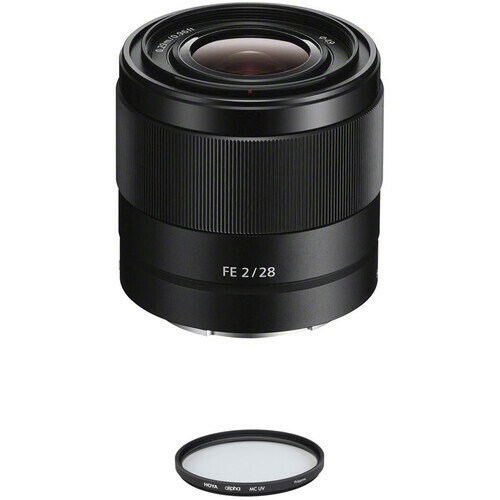 Covering a wide-angle perspective, this compact 28mm will pair nicely with Sony's full-frame E-mount cameras. It can also be used on APS-C format cameras where it will provide a 42mm equivalent focal length. A fast f/2 maximum aperture provides the ability to create images with a shallow depth of field as well as work in low-light conditions. Three aspherical elements, including one Advanced Aspherical (AA) element, are incorporated in the lens design to reduce astigmatism, field curvature, coma, and other monochromatic aberrations. The Hoya 49mm alpha Circular Polarizer Filter helps to reduce reflections and glare by filtering out light that has become polarized due to reflection from a non-metallic surface. The light from the sun naturally becomes partially polarized due to reflecting off electrons in air molecules, causing the light to scatter into what appears as haze. A polarizing filter arranges, and filters, this directionally polarized light perpendicularly to the reflected light, allowing for the absorption of much of this light. This results in a noticeable reduction of glare and reflections from non-metallic surfaces and an increase in the saturation of skies and foliage. Box Dimensions (LxWxH) 4.8 x 4.4 x 3.2"
FE 28mm f/2 Lens with Circular Polarizer Filter Kit is rated 4.7 out of 5 by 125. Rated 5 out of 5 by Green Flash from Best all round lens for A7r This lens at 28 mm and f2 is actually a game changer for the A7r, because with it I can finally reliably get clear in focus images that fully utilize the enormous potential of the a7r sensor. And it does this with a hugely useful field of view for many kinds of shots including especially much better low light images than achievable with the many f4 lenses provided for this camera. It is easy to take strikingly clear in focus shots, partly because it has a greater natural depth of field than any other lens I have used with my A7r. This is the best all round lens for the A7r to date, and with the Zeiss 55mm 1.8 allows image quality to equal that from the D810. Rated 5 out of 5 by George from Excellent lens for photo and video I purchased this lens to use on my a7s and gimbal, however I found that it gives an interesting look for photography as well. I've used it in a couple weddings so far and this lens is very sharp and has good auto focus. For video, this is a great focal length for a stabilizer. It is not so wide that you have to stand a foot away from what you are recording and it is not so narrow that you have issues with movement speed. I was considering the 35/2.8, however that extra stop of light is nice for receptions. The lens does have some distortion, however it is to be expected on a wide lens. It doesn't bother me at all and just use it to create more interesting photos. Rated 5 out of 5 by JJ Arcinas from Sony's best low budget prime! I know there are plenty of people that might look down on this lens simply because it lacks an uber cool Zeiss badge. I'm very satisfied with the purchase and the pictures I get from this lens are sharp and gorgeous! I sold my 35 2.8 zeiss to get this lens, and i don't regret it. Yes it lacks the zeiss T* coating, but it still handles shooting at a direct light source pretty well. Yes it has distortion when shooting in RAW, but that is easily correctable in post processing. It does have some vignetting wide open, but I think it adds character. Build Quality is almost on par with the zeiss lenses, metal construction except for the black ring in the front of the lens which is plastic. Rated 5 out of 5 by Nick from Great for gimbal work! I bought this to complement my 10-18mm for use with an a6300 and a Pilotfly H2 gimbal. I found that the 10-18 is great for some stuff but often is too wide. Also the 10-18 is only an f/4, so I wanted something a little tighter and a wider aperture. The 28 really fits the bill. On my a6300 it's more like a 42mm. I don't shoot many photos, but for video work in 4K it's super sharp. It also focuses really close, which is great. It's lightweight and perfect for gimbal use. Overall you can't go wrong. Optically I'm sure it's not quite as good as a G Master lens or even the Zeiss Batis 25mm (which I also considered) but frankly it's also not nearly as expensive. And for my eyes, it's plenty sharp enough for 4K video and I do use it professionally. Rated 5 out of 5 by Shumai from Just get it! Awesome lens. Bought the 28mm 2 and the 35mm 2.8 for my 3 week trip to Japan. Used the 35mm at first during the day time and the 28mm came out at night for low light shots. But after a few days I just fell in love with the way the 28mm shot and kept the 28mm on full time. 35mm stayed at the airbnb I booked. Low light shots with f/2 compared to f/2.8 is a big difference and the narrow cramped streets / bars of Japan made the 28mm a clear winner. I wonder if I'll love the 28mm as much for shooting in other parts of the world where its not as cramped/narrow. Guess time to book my next trip! Rated 4 out of 5 by Joe from Best you'll get for the price Very sharp lens - even if it's softer at the corners it still looks razor sharp when compared to the kit lens at 28mm. Not sure I'd use it for architecture....raw files have enormous distortion and very high chrom. abberation. Correctible in camera raw and other various software, but there's always sharpness lost when such a drastic correction is made. But for vacations and all around fun it's great! Small, light, fast - well, a prime at this price - doubt you'll see that often. All around great lens unless you're into architectural photography. Rated 4 out of 5 by Apurva from great for street not necessary low light its a great lens for day time and general purpose walking around. The only problem you will have is focusing at night/low light. its focus by wire and the focus ring moves very fast. I was trying to make a portrait in blue hour with city lights in the background. The thing kept on missing focus even though it was sitting on a a7s. They advertise the fish eye converter to be F2 but it isn't. Its actually F3.5 so if you are buying this lens for the fish eye, keep that in mind. Other wise this is a good Lens. I use this lens when i am lazy and i don't want to carry a tonne of gear. Now its perfect for street photography. The filter thread on this lens appears to sit deeper than the front element, raising the possibility of a thick filter touching the glass piece. Has anyone tested the B+W F-PRO 007 49mm MRC Clear Filter with this lens to see if it stands clear of the front element? Filters will work without issue on this lens. They will not touch the front element. Is this lens good for video? I personally love it for video when using a stabilizer like the Ronin because of the autofocus. However, manual focus is annoying on these lenses because of the focus-by-wire design. On a Sony a6000 series camera how does the image quality of this lens compare to that of the Sony Zeiss 24mm f/1.8 lens? Would this lens be good for astro or landscape photography? Any decent quality lens can be used for astro photography, including this 28mm f/2. It worked very well for me shooting landscape stuff recently in Death Valley. Does this focus to infinity? All Sony FE lenses are focus by wire. It does focus to infinity but there isn't a hard stop. dose this come with a lens cap and a rear cap? How is the corner sharpness on this lens? And the ultrawide 21mm converter? I've seen mixed reviews. Corner sharpness looks OK with the 28mm, f2. Where is this lens manufactured? This lens is manufactured in Thailand.